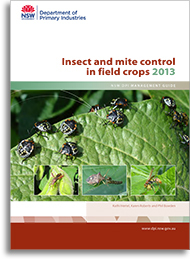 This publication contains information on how to control the more important insect and mite pests of azuki bean, canola, chickpea, cowpea, faba bean, field pea, linseed, lucerne, lupin, maize, millet, mungbean, navy bean, pigeon pea, safflower, sorghum, soybean, sunflower and winter cereal crops. Brief descriptions of some major pests and their damage are given to help you recognise them. It is important to check crops regularly for pest and beneficial insects and to get accurate identification of insects and mites in crops. Most insects are not pests and there are many beneficials often present in crops that help keep a range of pests under control as well as performing other ecosystem services such as pollination and nutrient cycling. These are often destroyed by use of broad spectrum chemicals. We have included a section on Integrated Pest Management (IPM) and Pest Management in Organic Systems that are using sound environmental principles to achieve economic control of pests and reduction of chemical use at the same time. These systems require a holistic approach to the farming system to be successful, but are based on having a dynamic agroecosystem.